Elders Windsor (NSW) store manager Adam King with two of the branches Toyota forklifts. 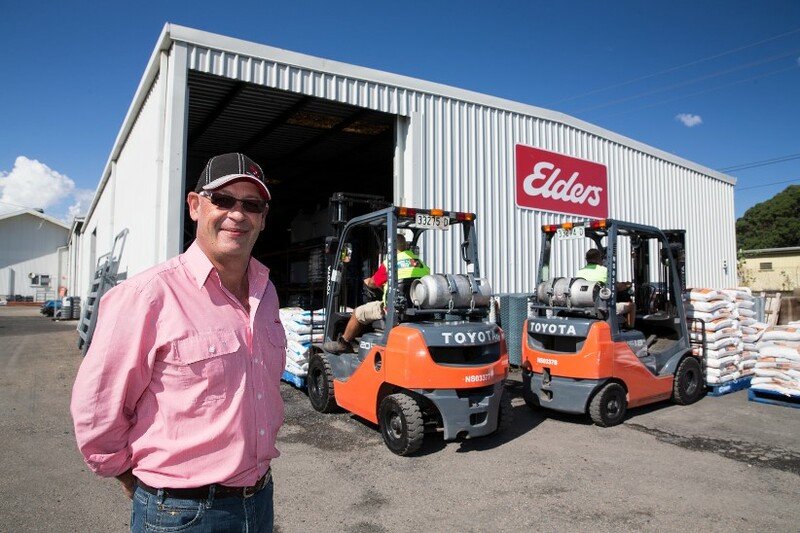 Elders provides a broad range of agricultural products and services through its 370 outlets primarily located in rural and regional areas right across the country, which meant it had unique requirements when it came time to tender for a new forklift provider. Elders’ fleet manager Jeff Howarth said Toyota’s ability to meet the requirement of having one forklift at each of its outlets, and provide the associated service and backup network, was one of the key factors that tipped the balance in Toyota’s favour. “It was a critical consideration for us, given that the nature of our business means we’re operating in some pretty remote locations,” Jeff said. Toyota Material Handling Australia (TMHA) corporate account manager Peter Lown said Toyota has made a concerted effort to open factory-owned and operated branches in regional areas. Jeff explains that being situated largely outside urban areas also means the reliability of Elders’ equipment is vital. TMHA’s willingness to meet with Elders and recommend the best solution for its needs was also a deciding factor in its decision. “Toyota’s on-site inspection made the selection process easier. Toyota took the time to come out to assess our needs and make recommendations about the type of equipment we needed to ensure our order met our specific requirements. “This was a real point of difference between Toyota and some of the other providers we considered, and it’s one that we really appreciated,” he said. With the benefit of Toyota’s advice Elders settled on a range of Toyota’s 8-Series FG forklifts, with capacity from 1.8 to 3 tonnes. The forklifts are currently in operation at 50 of its branches throughout Australia. Toyota’s popular and award-winning 8-Series forklifts contain a number of leading safety features, including Toyota’s System of Active Stability (SAS) technology that helps prevent tip-overs. Other safety features include an Operator Presence Sensing system that stops the forklift from moving unless the operator is correctly seated at the controls, while the Active Mast Function Controller can sense instability by limiting the mast angle and speed according to the height and weight of the load. The 8-Series also offers a large, easily accessible workspace with a wide foot area, a tight turning circle for improved manoeuvrability, ergonomically designed controls, excellent forward visibility and a comfortable and fully adjustable operator restraint suspension seat with added lumbar support. The powerful and fuel-efficient engine is tuned to minimise noise levels in enclosed environments and Toyota’s hydraulic lifters help lower engine noise and reduce maintenance. Jeff explains that the forklifts are used primarily to load and unload trucks and customers’ vehicles. After positive experiences with other Toyota products, the quality and reliability of the Toyota equipment came as no surprise for Elders. “Our procurement manager had used Toyota forklifts in the past at another company, and he had good experiences there so we knew what to expect with the new forklifts,” Jeff says.